Whether your taste is simple or ornate, we can create the perfect framed mirror just for you. Mirrors are great additions to any home. Entryways, halls, bedrooms, living rooms, dining rooms, bathrooms— any room is perfect for a mirror display. 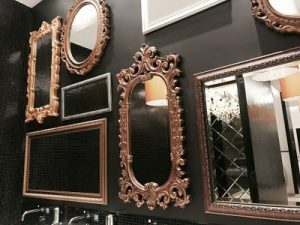 We can make your mirror a work of art by creating a magnificent frame design. Coordinating your furniture and walls is our special- ty. Style, size, and shape are all factored in to make a smooth decorative transition. Beveled mirrors add an extra sparkle. We use the best quality glass and polished edges. We can make samples to show you the different size bevels. If an antiqued mirror is your style, we can create that, too. As a special service, we can deliver and hang your mirror. It is our pleasure to serve you. So stop by the store and let us create a wonderful mirror and frame design that reflects your personality and home décor.